Download the full 2011/2012 report (PDF 2.7MB). 1 | Philadelphia. Philadelphia hosts a disproportionate share of Pennsylvania’s lawsuits and, as demonstrated by this report, forum shopping for plaintiff-friendly courts within the state is primarily a “Philly phenomenon.” Of greatest concern is the Complex Litigation Center (CLC) in Philadelphia, where judges have actively sought to attract personal injury lawyers from across the state and the country. Plaintiff-friendly law, expedited procedures, a reputation for a high plaintiff-win rate and generous awards contribute to Philadelphia’s status as a venue of choice. Success in addressing the flow of medical liability cases to Philadelphia and the legislature’s recent limiting of a defendant’s liability to its share of fault provide some hope for the future. 2 | California. While Los Angeles historically earned a reputation as the most plaintiff-friendly jurisdiction in the Golden State, small business-destroying lawsuits filed by professional plaintiffs have spread throughout California. These individuals have filed thousands of extortionate claims against popular family-owned restaurants, book stores and salons, demanding thousands of dollars to settle allegations of technical violations of disabled access standards, and California’s courts have enabled the extortion. Recent court decisions demonstrate that California remains friendly to consumer lawsuits (even after voters attempted to rein in abuse), class actions, and high awards. The California Supreme Court deserves praise for its recent rejection of “phantom damages,” but the adverse effect of its late 2010 decision allowing local government officials to hire private contingency-fee lawyers to enforce state law is now becoming evident. 3 | West Virginia. West Virginia’s high court reached well-reasoned decisions this year when interpreting its consumer protection law and upholding the limit on subjective pain and suffering damages in lawsuits against healthcare providers. Such rulings, while helpful, do not address core problems in West Virginia’s civil justice system, such as its lack of full appellate review, liability rules that are out of the mainstream, and excessive awards. West Virginia continues to be a haven for weak lawsuits by plaintiffs from other states. The state’s attorney general remains under fire for running his office as if it were a private personal injury law firm and distributing litigation settlements to programs and organizations of his choosing, rather than the state and its taxpayers. 4 | South Florida. South Florida, known for its aggressive personal injury bar, is the national epicenter of excessive and fraudulent automobile insurance litigation and tobacco lawsuits. The state’s insufficiently rigorous standard for admission of expert testimony contributes to its reputation as a Judicial Hellhole. While the state legislature has made steady progress in reasonably limiting liability in certain areas, the Florida Supreme Court’s record of striking down such legislative efforts leaves observers cautiously optimistic at best. 5 | Madison and St. Clair Counties, Illinois. These two counties in the Metro East have come a long way since hitting rock bottom, but there are concerns of a relapse. For instance, this year the Illinois Supreme Court reversed a Madison County ruling that, after a one-sided trial that favored the plaintiff, would have imposed new liability on manufacturers. Mid-level appellate courts threw out two class actions certified by Madison County judges. And a tobacco lawsuit that had resulted in a $10.1 billion verdict may be back on the Madison County docket. Similarly, after significantly culling its asbestos docket in recent years, Madison County is again the national epicenter for such lawsuits. Only about 1 in 10 asbestos claims have any connection to the area. Neighboring St. Clair County has also emerged as a magnet for mesothelioma claims and hosts lawsuits against pharmaceutical companies from around the country. 6 | New York City and Albany, New York. The mayor of the Big Apple and its chief legal officer plead for reforms that would reduce the massive liability payouts that cost taxpayers over $500 million annually, but state legislators in Albany remain wedded to the plaintiffs’ bar. The same expansive liability that burdens the city also takes its toll on New York’s businesses, such as the photography studio being sued by a groom who was not satisfied with his wedding album and sought to re-create the wedding after a divorce, or the White Castle patron who brought a federal case against the restaurant when, at 290 pounds, he could no longer comfortably fit into its booths. Offering a minor dose of sanity, New York’s highest court upheld dismissal of a lawsuit, featured in the 2010-2011 report, wherein one golf pal sued another after being struck by a bad shot. 7 | Clark County, Nevada. Since Clark County’s May 2010 verdict that pinned a half-billion dollars in liability for an endoscopy clinic’s unsanitary, illegal practices on a drug maker, the hits just keep on coming. Even as separate state and federal criminal prosecutions proceed against the clinic’s owner, Clark County juries returned two more multimillion-dollar awards against the company under the theory that it should have offered a widely-used anesthetic solely in smaller vials to limit the potential for reuse, despite a clear warning on the label against use for multiple patients. Some Clark County judges have kept jurors from learning the full scope of the clinic’s role in the resulting Hepatitis outbreak when considering the drug maker’s responsibility. 8 | McLean County, Illinois. After a year of observation on the “Watch List,” McLean County advances to a Judicial Hellhole due to its unique practice of allowing lawsuits that seek compensation for asbestos-related injuries, even when the plaintiff did not come in contact with the named defendant’s products. These “civil conspiracy” lawsuits target deep-pocket companies with allegations that they had some role in concealing the dangers of asbestos from the public decades ago. One such McLean case recently resulted in a stunning $90 million verdict. Beyond the Judicial Hellholes, this report calls attention to several additional jurisdictions that also bear watching due to troubling developments or their histories of abusive litigation. Watch List jurisdictions fall on the cusp – they may drop into the Hellholes abyss or rise to the promise of Equal Justice Under Law. The Eastern District of Texas is known for its growing, costly patent litigation. It is rare for this report, which traditionally focuses on state courts, to include a federal district court. Cook County, Illinois falls from the Judicial Hellholes list due to a relatively quiet year with respect to the types of unsound rulings and extraordinary verdicts that have cemented its Hellholes reputation in the past. Southern New Jersey joins the Watch List this year, thanks in part to local employers’ fears of lawsuits there. Atlantic County, New Jersey, a magnet for massive lawsuits against the very drug makers that form the state’s economic backbone, drops from a full Judicial Hellhole to the Watch List, given a number of defense verdicts suggesting that defendants’ previously miniscule chances of winning may have improved somewhat. Franklin County, Alabama’s $61 million verdict in favor of a local manufacturer against an out-of-state software company is reason to closely watch this rural jurisdiction. Smith County, Mississippi awarded the largest single-plaintiff asbestos verdict in U.S. history, a $322 million award that the defendant has challenged on the basis that the presiding judge did not disclose that his parents had previously settled asbestos claims with one of the defendant companies, and his father had a pending claim in a nearby court. Louisiana has developed a cottage industry of lawsuits against energy companies, replete with unsubstantiated claims of environmental contamination. Over 250 of these lawsuits have impacted about 1,500 companies with many choosing to settle rather than risk unpredictable and financially devastating jury verdicts in local courts. The report awards Dishonorable Mentions to the Mississippi Supreme Court for an unsound ruling that abandons a core principle of product liability law, and to the Arkansas Supreme Court for striking down the state’s perfectly reasonable statutory limit on punitive damages enacted in 2003. An appellate court and the Missouri Supreme Court are also criticized for letting stand a shameless class-action coupon settlement. 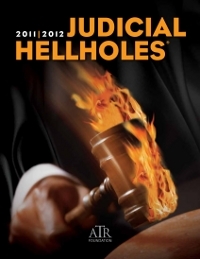 This year’s report enthusiastically emphasizes the good news from some of the Judicial Hellholes and across the country. Points of Light are examples of, among other things, positive legislative reforms and fair and balanced judicial decisions that adhere to the rule of law. State legislatures enacted nearly 50 civil justice reforms in 2011. These included comprehensive tort reform packages in Wisconsin, Tennessee, Alabama, and North Carolina, and more targeted reforms in Arizona, Florida, Indiana, Kentucky, Missouri, North and South Dakota, Oregon, Pennsylvania, South Carolina, and Texas. Examples of such reforms include strengthening standards that guard against junk science in the courts, ensuring that courts do not broaden liability of landowners to those who are injured while trespassing on their property, limiting the amount or interest rates on pre- and post-judgment bonds, and requiring state officials to make certain disclosures when hiring private lawyers to represent the state. Sound rulings by several courts, some of which are located in states that otherwise have reputations as inhospitable to civil defendants, are particularly worthy of note. The California Supreme Court rejected inflated damages for the costs of medical treatment. The District of Columbia’s highest local court found that, despite the broad language of the city’s consumer protection law, the basic principle that a person must be harmed before bringing a lawsuit applies. The Illinois Supreme Court threw out a Madison County ruling that established a new and costly duty for manufacturers to warn consumers of remote risks of injury long after their purchase of the product. The West Virginia Supreme Court of Appeal upheld the state’s limit on subjective pain and suffering awards in cases brought against healthcare providers and facilities. The U.S. Court of Appeals for the Fourth Circuit reinstated a suit against a personal injury law firm alleging that attorneys engaged in a scheme to file in West Virginia courts fabricated asbestos claims with no factual basis.